A new UNU-IAS Policy Brief outlines recommendations for better bridging the potential of the higher education sector with the goals set forth in the global sustainable development agenda. 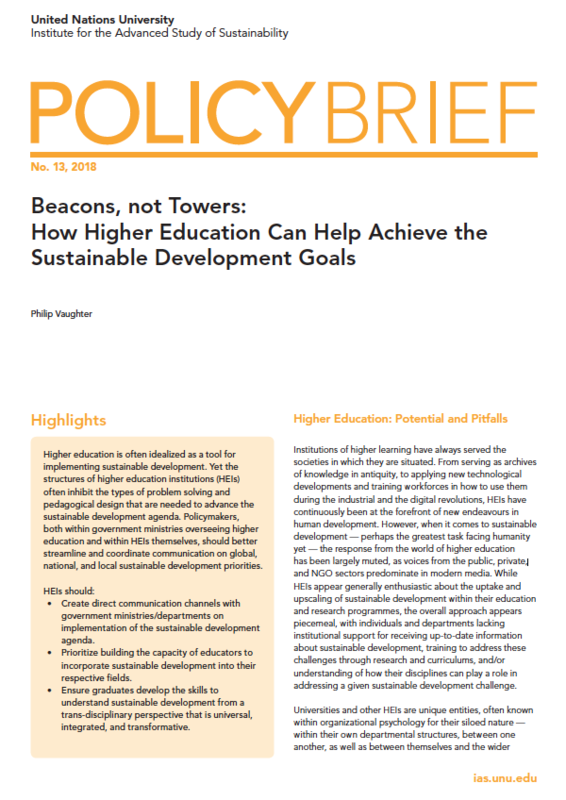 Beacons, not Towers: How Higher Education Can Help Achieve the Sustainable Development Goals was written by UNU-IAS researcher Philip Vaughter. It advocates improving communication and increasing awareness around sustainable development, building the capacity of educators within higher education, and promoting more integrated learning outcomes on sustainable development for graduates. Higher education is often idealized as a tool for implementing sustainable development. Yet the structures of higher education institutions (HEIs) often inhibit the types of problem solving and pedagogical design that are needed to advance the sustainable development agenda. Policymakers, both within government ministries overseeing higher education and within HEIs themselves, should better streamline and coordinate communication on global, national, and local sustainable development priorities. Create direct communication channels with government ministries/departments on implementation of the sustainable development agenda. Prioritize building the capacity of educators to incorporate sustainable development into their respective fields. Ensure graduates develop the skills to understand sustainable development from a trans-disciplinary perspective that is universal, integrated, and transformative.